“If you think I am ticked off, you should see my father,” said Jesus Christ as he stormed away from The Shroud of Turin in anger. “He gives you stupid people the gifts to figure out all the secrets of nature. He gives you the intelligence to learn about science and then you turn that knowledge against him and continue with this stupid crap about that shroud. There it is, plain and simple. Jesus Christ, on a recent tour of Turin Italy has himself said that the Shroud Of Turin does not, did not and will not ever belong to him. Of course people from The Discovery Channel and Nat Geo and Discovery immediately began production on “Analyzing Christ’s Mental Health” — a documentary about the long lost scrolls that once belonged to Christ’s psychiatrist and how Jesus was always in denial. Plans to get the Virgin Mary on “I Didn’t Even Know I Was Pregnant” are in the works too after talks with Lifetime Television fell through. “So I’m visiting this dumpy town in Italy and this guy from Nat Geo or Discovery or one of those fakata channels comes up to me with this old sheet of cloth,” said Jesus as he boarded the Alitalia plane that would take him to TelAviv where he will visit a cave somewhere in the Holy Land where he also maintains that he was not born or buried. “I tell the guy that the piece of cloth is not mine. It doesn’t even look like me, but he keeps going on and on and on about how this is the shroud of Turin and that I was buried in it blah blah blah. I’ll tell you right now, I am getting so sick of turning the other cheek because this guys was cruisin’ for a bruisin’. “Now, I watch TV as much as the next guy,” continued Jesus, “It has already been proven that the shroud is just a painting that was done about a thousand years after I was already crucified. Getting crucified hurts in case you didn’t know that, and I don’t appreciate a bunch of idiots who just won’t let something go — let it go I say.” Then Jesus gritted his teeth and held up his gnarled fists in a gesture that can only be described as menacing or angry — or an imitation of Kirk Douglas. 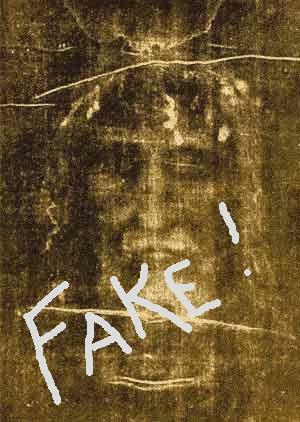 Jesus was alluding to the fact that scientific forensic evidence — the kind that puts modern criminals in jail — has already proven that the shroud is a fake or a forgery or at the very least, a painting that has been used to fool people for centuries. It doesn’t seem to matter to Shroud of Turin believers because no matter how much evidence is put before them, they still won’t drop it. “It’s just like that Kennedy assassination and that incident at Roswell, New Mexico,” continued Jesus. “I’m Jesus for chrissakes, don’t you think I would know who shot JFK or if aliens were walking around the southwest of the United States? I’m the one who signed the papers that put Lee Harvey Oswald to hell and on those papers I wrote, ‘This man goes to hell for murdering John Fitzgerald Kennedy‘ then I signed it with the special ink we have. You can’t erase that ink or alter it, but it doesn’t seem to matter for certain people. They just can’t accept it and the reason for that is because they are stupid. We don’t usually admit to making stupid people, but come on! 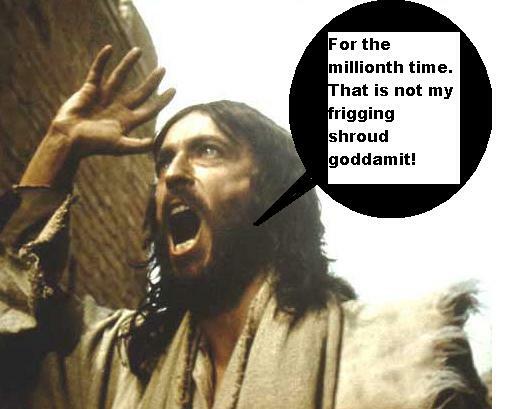 Jesus made a deal with the people from The Discovery Channel and of course they are jumping on the plan. Jesus visited Turin just days after leaving New York City in disgust. “I just don’t get it,” moaned the beleagured son of man. “These guys hijacked planes, and I know who they were, and they crashed them into the buildings and the whole thing was a disaster. It’s on frigging video tape — the whole thing is on tape but there are still morons who say that the whole thing is a lie. Now, like I said, this is on tape and witnessed by a million people at least. Still there are people who don’t believe it happened and TV shows that make documentaries about how it did not happen. On the distaff side, the Virgin Mary, who only gets respect in Catholicism and Islam because she is glossed over by other Christian faiths — the ones that Henry VIII invented so he could screw any girl he wanted — has decided that she is going to appear on a very special Christmas episode of “I didn’t Even Know I was Pregnant,” a show that tells the story of women who have babies without knowing that they were even expecting. “Yeah, so anyway, continued Jesus, “the freaking shroud of Turin is totally not my burial shroud and the next person who says it was mine will be smote – or smotted — or smitten — or whatever it is I can do to people. I’m not messing around. My real shroud is rotted to dust in some place that nobody knows about. I even forgot where it was, so just stop — stop — STOP!!!!!!! Have some goddam respect — literally! Larry King Drunk on the air while Sarah Palin rants about the Tea Party in Delaware.